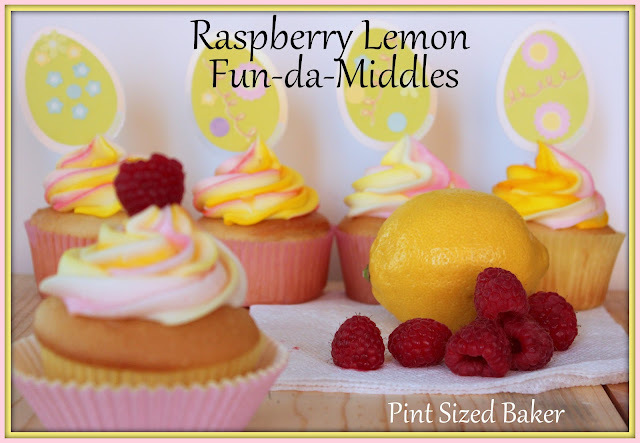 Yes, yes… I know… Another Fun-da-Middles cupcake treat. What can I say, I love them! You heard me right – I. Love. Them. 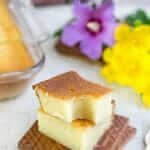 They really are so easy and fun and the cream center is just a wonderful, little surprise for people. 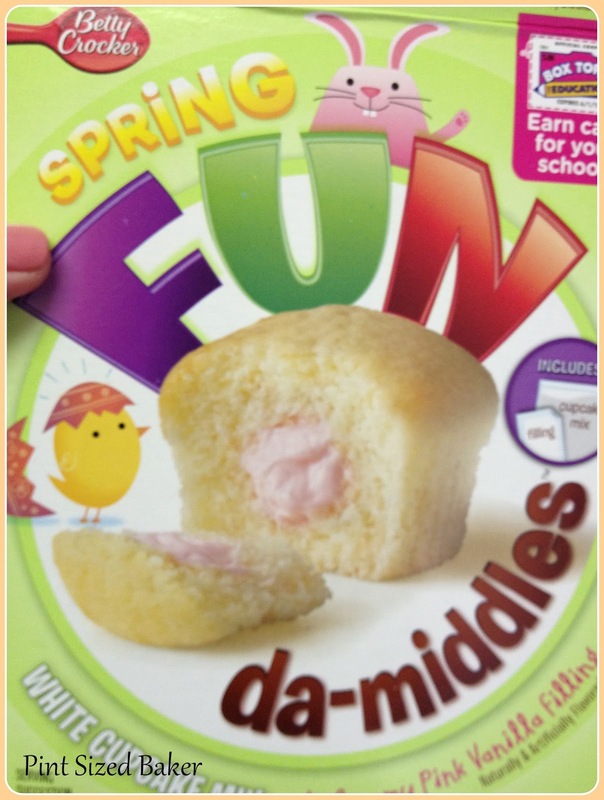 I bought the Spring Fun-da-Middles and thought the pink inside would be perfect for a raspberry (or strawberry) center. 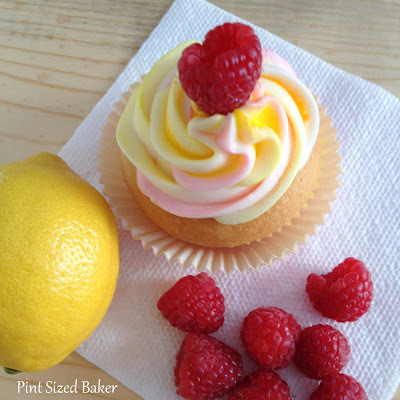 With the added Raspberry and Lemon frosting, these just yell for SPRING!! So, my little cup helped by making some cupcake picks for an Easter decoration. 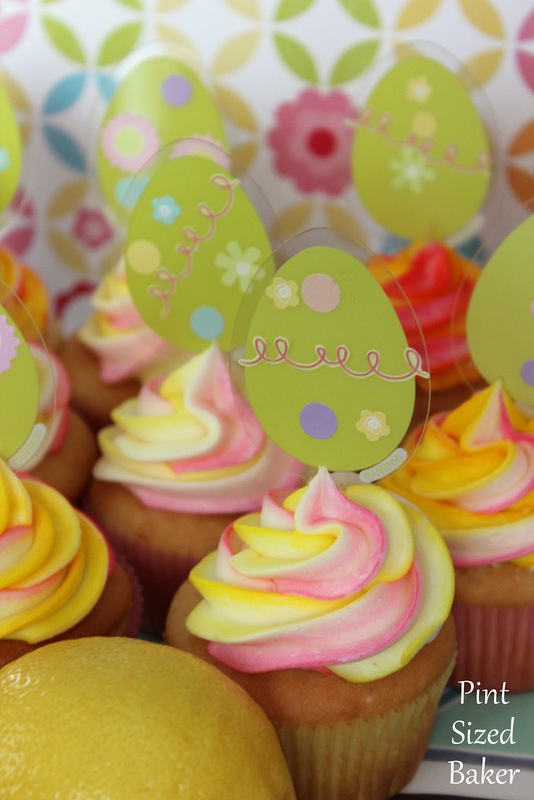 These cupcakes would be a great addition to any Easter gathering this weekend! Or any summer Bar-B-Que, for that matter. Follow the directions on the box and add in the Lemon extract to the cake mix. 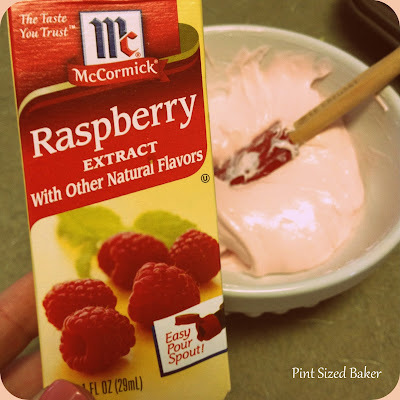 Squeeze the cream filling into a bowl and mix in the Raspberry extract. I added an extra 1/2 teaspoon, but flavor it to your liking. Transfer it to a sandwich baggie and cut off 1/2 inch from the corner. 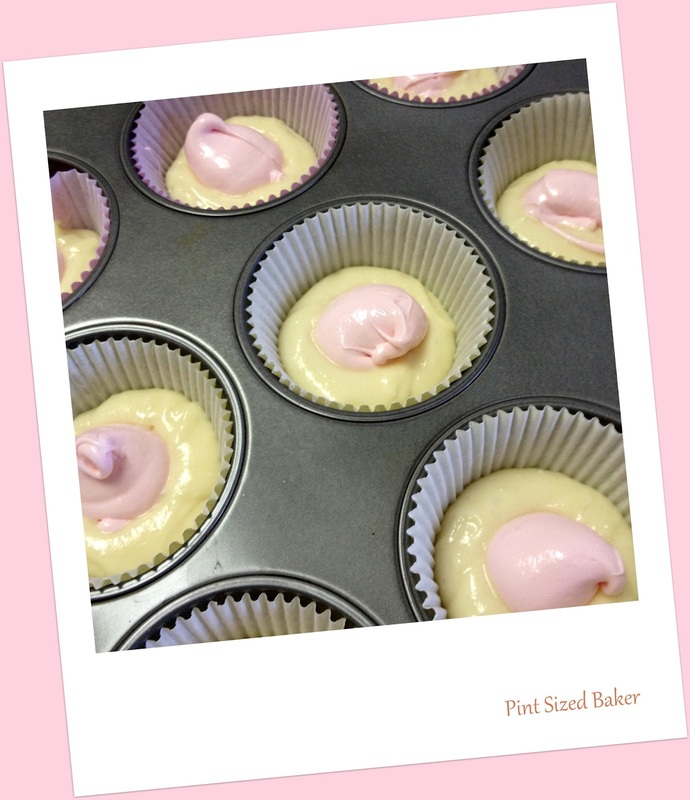 Add a tablespoon of cake mix to the cupcake pan, squeeze some cream into the center of the batter being careful not to get the cream on the paper liner. Add in the rest of the cupcake batter and bake at 350 for 25 – 28 minutes. For the frosting I made a basic buttercream and had LOTS of leftovers. This is a HUGE recipe. I’m sure for just a dozen cupcakes, you can make 1/3 of this recipe and still have enough! Also, I tried Spectrum brand Shortening for the first time in my frosting. I usually use Crisco brand, but this shortening has NO hydrogenated anything in it! 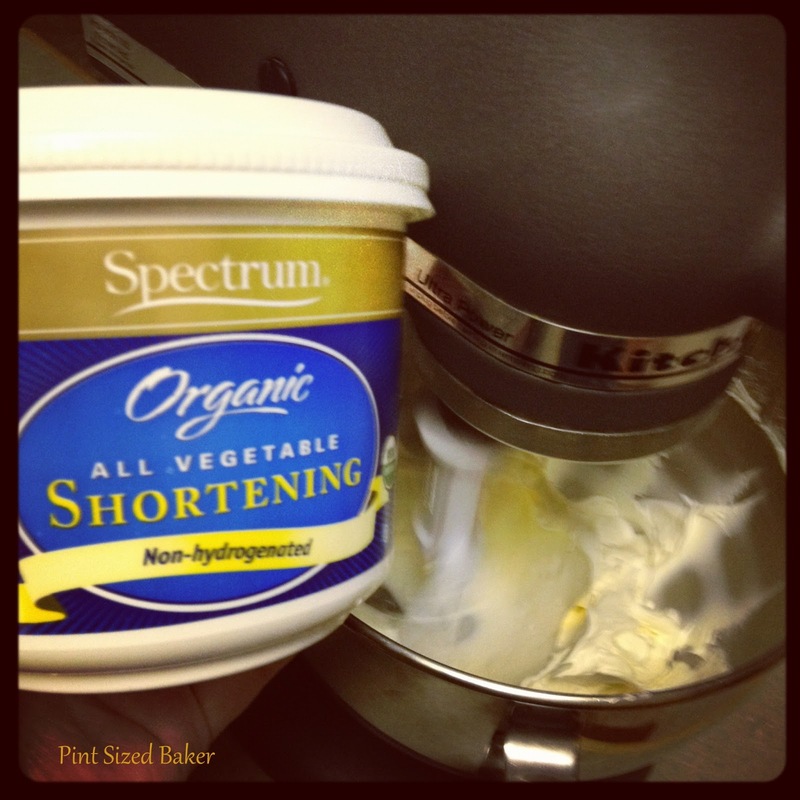 So, besides all the sugar and butter, this frosting is HEALTHY! At least, that’s what I told myself. 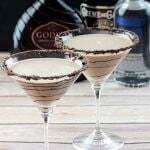 I saw THIS awesome technique via Confessions of a Cookbook Queen and had to try it myself! Basically, you add stripes of food coloring to your piping bag and then add the frosting. The first few cupcakes were super BRIGHT but the color faded the more cupcakes I frosted. I used some McCormick’s Neon coloring, so that might explain the brightness factor. I am so doing this again! I can see so many different possibilities! So many color combinations! I hope that you have a WONDERFUL Easter! The best part of our Easter weekend is that it rolls right into Spring Break! ** Side note to Bloggers – Google is shutting down PicNic and we are all sad… To my delight – when I edited these pictures today (April 1), almost all the features are now part of Picasa. There is also a collage feature. So check out http://picasa.google.com/ for your photo editing. I guess Google didn’t completely have their head in the toilet. I'm always drawn to lemon. I love how you did the frosting too. I've learned that before, but I haven't done it. I'll definitely need to give it a whirl. Thanks! the frosting like this was much easier than tinting two and trying to add them to the same piping bag for a two tone effect. Thanks for stopping by! 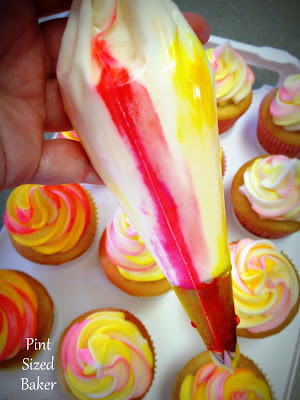 Oooh these look wonderful – LOVE the multi colored frosting!!! I really want to learn how to do that!!!!! Your cupcakes are just beautiful!!!! Thank you. Adding the food coloring to the side of the piping bag was very easy. I'll be doing this again! Loved the results. Gorgeous! Thanks for linking them up on TTT. I love the pretty colors! I use Picasa and love it. I also use google+ for extra editing. Lame Picnic shutter downers! This looks simply devine! 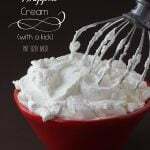 I would love for you to link up at my linky party via: http://ourdelightfulhome.blogspot.com/2012/04/show-me-what-you-got-linky-party-8.html to share this recipe with my readers. Thanks for the invite – Do you mind if I wait until next Monday to link up? I feel like I am super late to this party without a good excuse. I'll bring these cupcakes with me, promise! These are amazing! 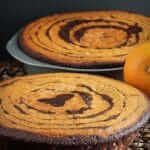 The way you piped the icing is just beautiful! 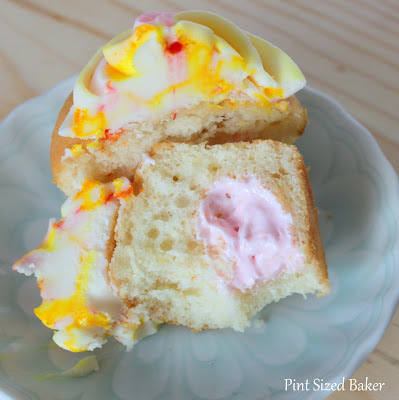 That raspberry and lemon frosting swirl is what caught my eye! How awesome! Thank you. I didn't know what to expect, but I was so thrilled when it turned out so beautiful! Beautiful cupcakes! Visiting from grateful belly. CONGRATULATIONS!!! 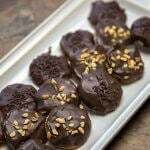 Your Easter recipe is being featured at Menu & Party Idea Round Up. Thank you for sharing your recipe with us at Cast Party Wednesday. Please grab a "featured" button. Woo Hoo!! Thank you so much 🙂 I love linking up at your party – it's always a great turn-out! 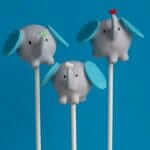 Thanks Dorthy – they are a fun cupcake and provides a great base to Doctor up! The kids will love them! Oh my goodness gracious! 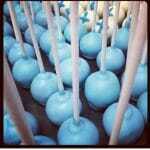 First of all they look delicious, but I LOVE the frosting! So pretty. Thanks so much for sharing at Whimsy Wednesdays! We go live again this Tuesday at 8 EST. 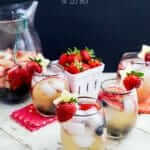 I can't wait to give your awesome recipe a try, these look so pretty! Hope you have a wonderful week and thank you so much for sharing with Full Plate Thursday. I have never heard of Fun Da Middles, but my parents are in Washington right now so I might have to email them and get them to bring some back for me to try. These look so FUN! Thanks for sharing at Scrumptious Sunday! Thanks so much for linking up all this deliciousness to last weeks party. I hope you'll join me again this Thursday. Have a great week.